Wrestling has long been a strong sport in the area and boasts some of the best grapplers in not just the region, but the entire state. Although there were plenty of exceptional athletes to choose from, our 2017-18 All-Herald Wrestling Team reflects the best of the best. The top 10 on our team have shown the ability to dominate the competition at every level. For the third year in a row, Southington tops our All-Herald squad with three selections. The Blue Knights were able to win with a lineup stacked with talent, and after a strong showing in not just Class LL, but in the State Open, it was easy to see why. Paul Calo followed up an outstanding sophomore campaign with an even better junior season. Competing in the 170-pound weight class, Calo rolled through his competition. The Blue Knight once again placed with runner-up finishes in the Class LL final and State Open, before coming away with his second New England title with 9-0 major decision over Sam Anderson of Sanford, Maine. He then went on to compete at Nationals where he went 2-1. With another season still to go, Calo could leave the school as one of the best wrestlers to come through the program. Next is a newcomer to our team in Jacob Cardozo, and he did plenty to prove he was one of the best on the mats this season. In the 126-pound weight class, the junior showed he is a tough opponent for anyone, finishing the season with a 42-14 record and an all-conference selection as a result. But it was in the postseason meets where Cardozo shined. He won his weight class’ CCC title and went on to take fourth in both the Class LL and State Open meets. He also competed in Nationals. Shaun Wagner earns his way onto our All-Herald team once again, and had a strong showing his senior season. An all-conference selection in the 138-pound weight class, Wagner was a place winner in all three major tournaments - Class LL, the State Open and New Englands, where he placed fifth, fourth and fifth, respectively. Like his teammates, he then went on to compete at Nationals. He will certainly be missed next season. 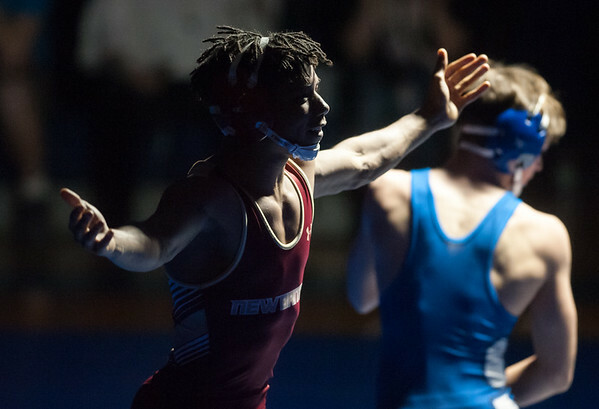 It was quite the turnaround season for New Britain, and as a result, place two grapplers on our team. Elijah Watson turned in a dominant season for the Hurricanes and quickly made his name known in his first full varsity season. Wrestling at 132 pounds, the junior captain went 32-2 to earn all-conference honors. Along the way, Watson took first place at the Highlander Invitational (132) and third at the Skip Arden Tournament, where he bumped up to the 145-pound weight class to face tougher competition. In the Class LL tournament, Watson placed sixth and went on to compete in New Englands. But what was perhaps most impressive was Watson competed the entire season with a torn meniscus in his right knee and waited until after competition was done to have surgery. Joining Watson from New Britain is teammate Izaiah Medina, who is also making his first appearance on our team. Only a sophomore, Medina showed he will be a tough opponent for seasons to come. He closed out the year with a 25-15 record, placing third in his weight class (195 pounds) at the Skip Arden Tournament. He also took third in the Pin to Win Cancer Tournament in Pennsylvania, doing so for his mom. Medina then placed fourth in the CCC tournament and the Class LL tournament, which qualified him for New Englands. Eduardo Morales competes with the New Britain wrestling team, but comes from Goodwin Tech. The junior turned in a terrific season on the mat, ending his season with a 30-14 record, with his fastest pin coming in nine seconds. Along the way, Morales placed third in the Skip Arden Tournament and fourth in the Portland Invitational. In the Class S tournament, Morales placed sixth in the 195-pound division. He also qualified for the State Open. It was an up and down season at times for Berlin, but the Veleas brothers - Josh and Dan - were among the best and most consistent in the entire region. Josh is making his third All-Herald appearance in as many seasons. Along with being named all-conference for the fourth consecutive year, Veleas boosted his career record to 139-44 after going 39-9 in his senior season, with 29 of those wins coming via pin. A three-time state place finisher, Veleas took fourth in Class M in the 160-pound weight class, securing his spot in the New England tournament. He is deciding between UConn and Bryant for college. Dan, meanwhile, turned in another strong season of his own. After winning the Class M title at 120 pounds last season, the junior won his second state title this year after jumping up to the 132-pounds weight class. He also earned a spot in the New Englands and came away with all-conference honors. With his senior season still left and all signs continuing on that upward trend, expect big things from Veleas when his final year in a Redcoats uniform rolls around. Two Plainville grapplers round out our All-Herald team. Sebby Soli once again finds himself on our team after a successful junior season. After surprising people last year, Soli did more than meet the challenge as one the Blue Devils’ best wrestler this year. Soli placed sixth in Class S in the 126-pound weight class, earning him an all-conference selection. Dom Pedrolini is the final wrestler on our All-Herald team. The 113-pounder for Plainville dominated his weight class this season and went on to place sixth at the Class S tournament before competing in New Englands. With both Soli and Pedrolini returning, the Blue Devils should have a tough 1-2 combination for next year. Posted in New Britain Herald, Berlin, General Sports, Goodwin Tech, New Britain, Plainville, Southington on Tuesday, 10 April 2018 14:22. Updated: Tuesday, 10 April 2018 14:24.